Dale Jenkins, president of the Illinois Traction Society, lives in a world of railroads. But not all railroads are created equal. His focus is on the now-defunct terminal railroad - better known as “the interurban”, an unusual and unique service provider which ran on electricity and was partially responsible for bringing electricity to several small towns and rural areas of Illinois. 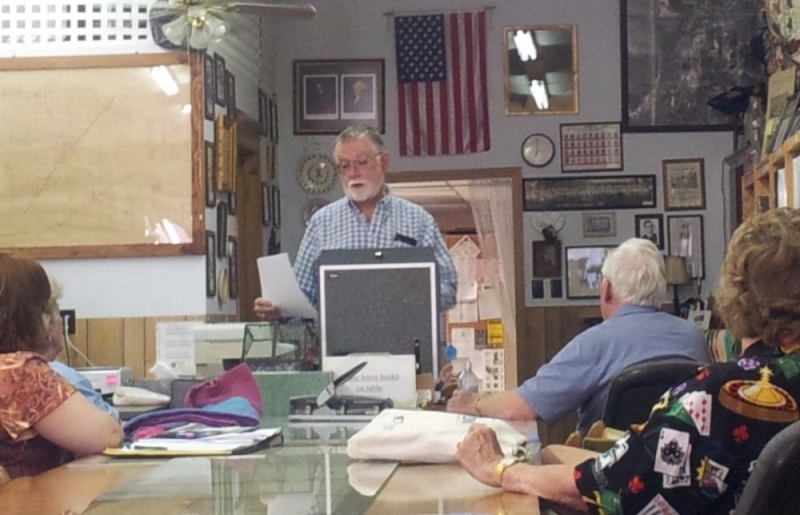 Jenkins shared his world of the Illinois terminal railroad system during a program on Monday night at the Logan County Genealogical and Historical Society. Older visitors shared their experiences of riding the railroad, others attended to learn more of the system they knew only from family stories. LCGHS president, Bill Donath, gave the presentation for the evening. He explained the current research project he is conducting. 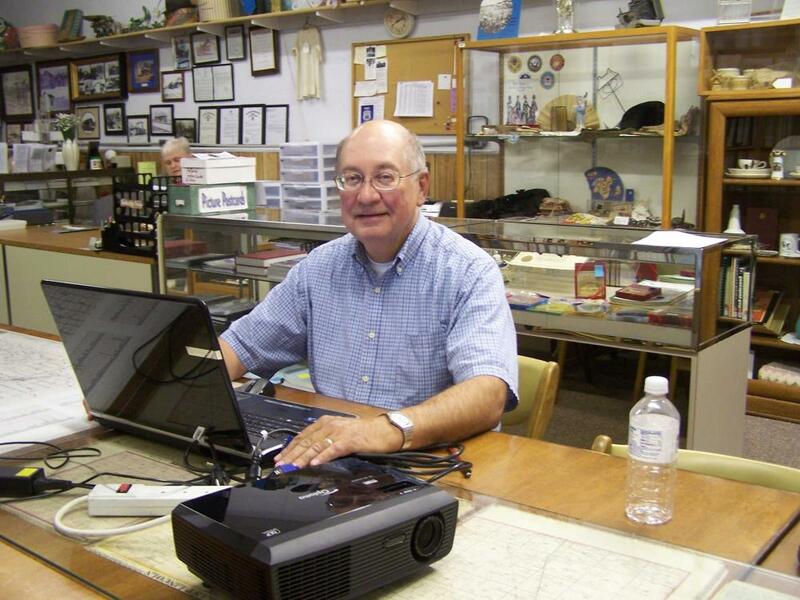 Bill began this past January collecting information about Logan County during World War I. The information includes the effect of the war on the people, organizations, businesses and families. The process he is using involves reading county newspapers, books and other publications of the WWI period. He also collects information that would not have happened had the war not occurred. He makes copies of those articles and scans them into his computer. There are scores of files under the heading of WWI Research. He has found that during October, 1918, the Spanish Flu Epidemic hit Logan County causing double anxiety with the war being the other. Many deaths during this period from both the war and the flu caused a level of grief that must have equaled that which occurred during the Civil War. His research will continue until he has read all of the county newspapers of the period. He is nearly finished with the Lincoln Courier-Herald of 1918. He will go back to 1917 and also do 1919 since many of the soldiers and war personnel did not return to the U.S. until the third quarter of 1919. As he reads the papers he compiles an index of the vital statistics of births, marriages and deaths. 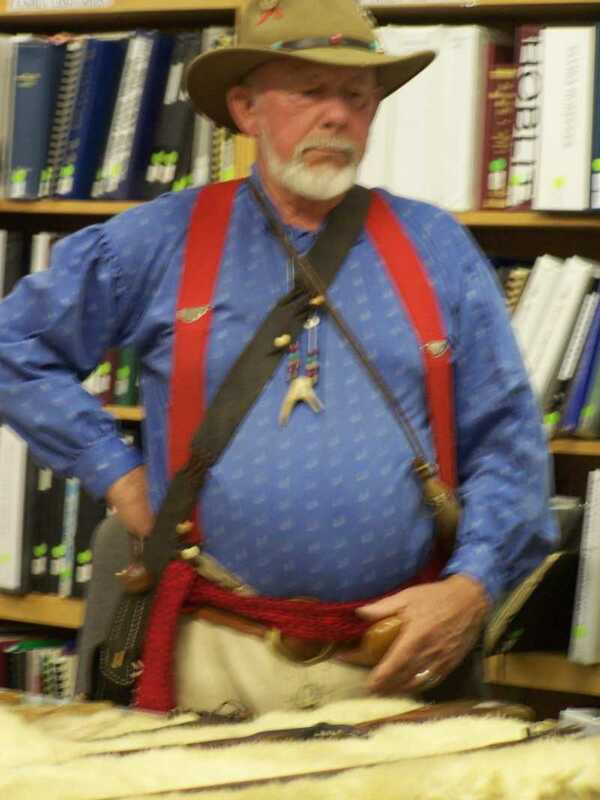 Other sources of information for Bill's research are also used, such as: www.Ancestry.com, WWI websites, books from the period and books published by LCGHS. He approximates that his research will continue for another two years. Many of the articles are being reprinted in the LCGHS Quarterly, Roots & Branches along with articles from the Civil War era which he had collected during earlier research. The research of the Civil War era has been included in two books: “Logan County During the Civil War” and “Logan County’s Civil War Dead”. He has no plans at this time for publishing a book or books about this era. Anyone who wants to contribute to this collection may do so by regular mail or email. 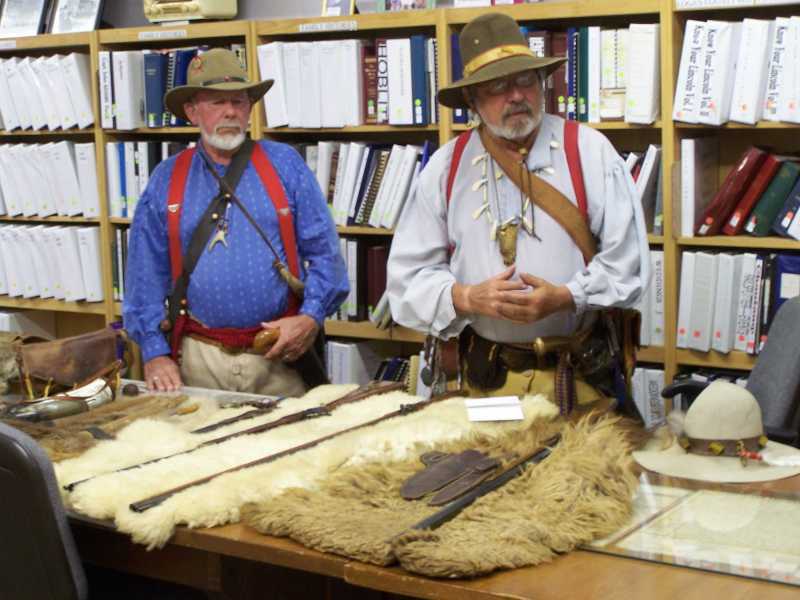 Fur Trader re-enactors, Sam Schriber and Marshal Miller, displayed and discussed the tools, utensils, and equipment used by the frontiersmen when making camp and hunting on the Illinois prairie. They explained that the fur traders were active through about 1840, when silk became more available and desirable than furs for clothes making. The materials and artifacts exhibited by the two presenters represented the period 1825 to 1840. 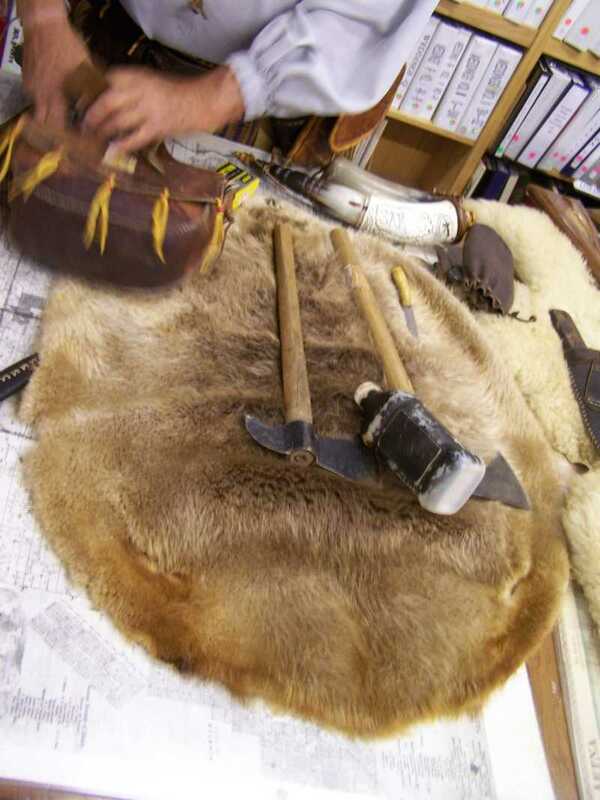 Fur samples, including beaver, bison, mountain sheep and coyote, were displayed. 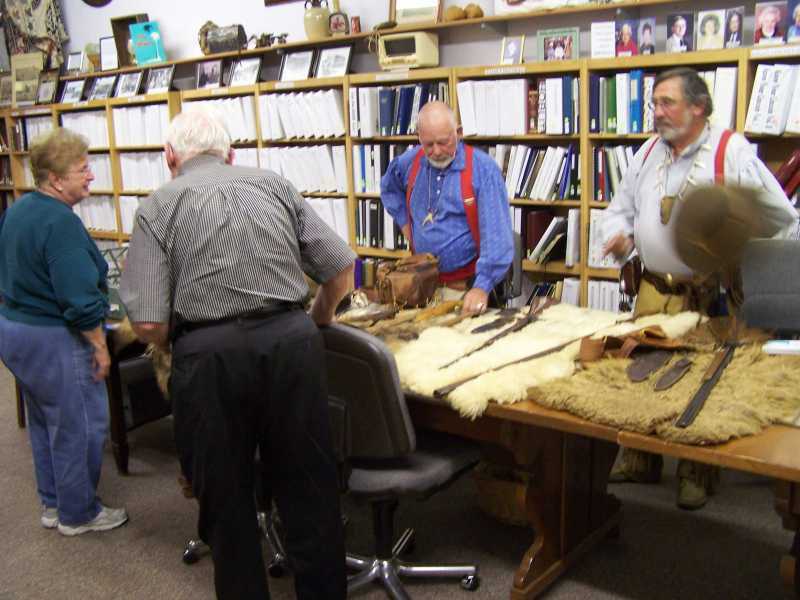 The tools, including black powder rifles, flintlock pistols, knives, powder horns, patches and shot, of the trappers were also exhibited, explained and demonstrated. It was explained that once the traders had collected the furs, they came together at large meetings called "Rendezvous". 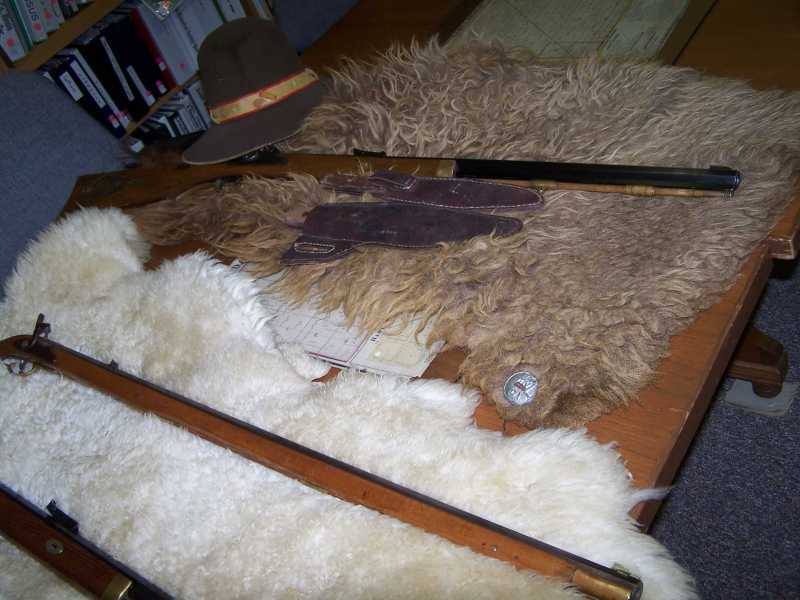 At these meetings furs were traded for supplies or sold for money. Traders had many activities available to them at the Rendezvous, not all of which made the trader more prosperous. 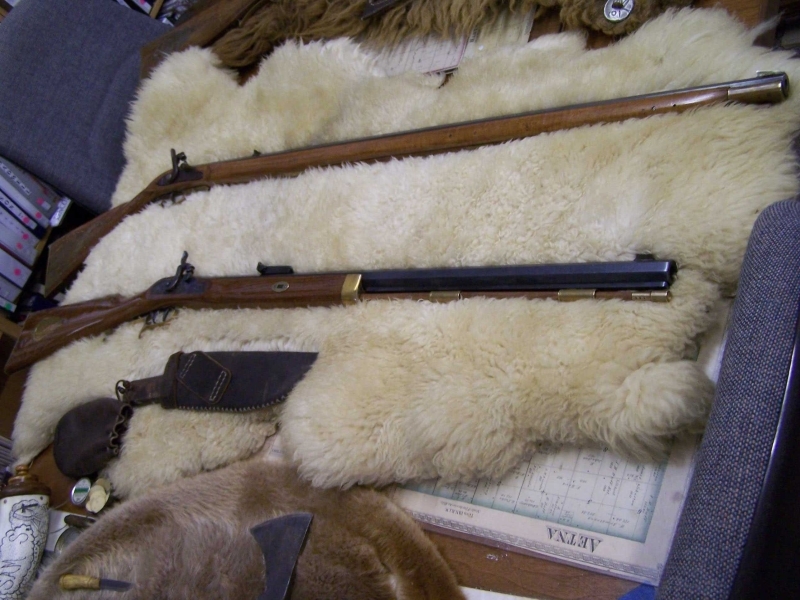 Sam and Marshall related that there are opportunities every weekend during the good weather months for them to be at a fur-trader re-enactment within a 250 mile radius of Logan County. They are best known for their authentic leather clothing, full-sized teepee and rustic campsite. 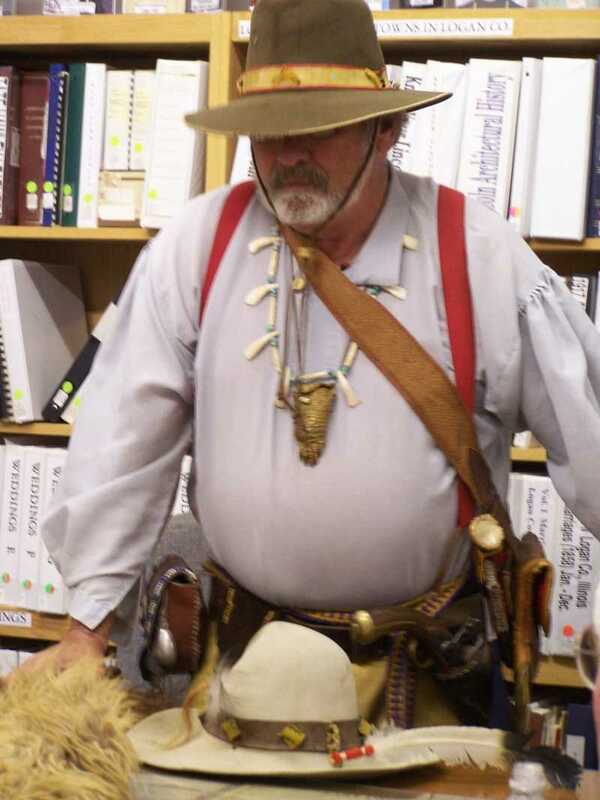 They were at the 1800’s Craft Fair at Postville Courthouse during the Lincoln Balloon Festival and are one of the exhibits at the Railsplitter Festival. Both Sam and Marshall are residents of Logan County. Bill Post of Middletown gave a very interesting talk about Middletown and its connection with Abraham Lincoln. Bill told us that Middletown was founded in 1832 - the oldest existing town in Logan County, which also has the oldest brick building (circa 1840), which has been been restored and now houses the Middletown Historical Society. They have many books, many of them given to them by the now defunct San Jose Library (also obtained their book cases). Logan County Surveyor, John Calhoun, asked Abraham Lincoln to be Logan County Deputy Surveyor for the Musick's Ferry project (one mile north of Middletown). Lincoln also surveyed the nearby town site of Albany (not populated significantly for township). Bill mentioned several additional fascinating events that have occurred over the years in and around Middletown - one being the unexpected landing of the Vin Fiz (Wright-Brother's bi-plane) in 1911, which was on a transcontiental flight from New York to Long Beach, CA. Another record-setting event occured with hot-air balloons. shared their research and displays for our program. who played a part in setting the stage for that major event in U.S. history. On Monday, April 16, 2012, LCGHS was the recipient of a $2,500 donation from Monsanto. Members Karen & Loren Birnbaum were significant participants in LCGHS’ good fortune. Karen & Loren were attendees at a Monsanto meeting where they put their name in for a drawing. Their name was drawn and they were asked to designate the donation from Monsanto - they chose our LCGHS. Chad Bockstadter (Monsanto), Karen Birnbaum, Loren Birnbaum and Doug Butler (Monsanto). The donation will be applied toward the replacement of the ceiling and lighting in the main room of our LCGHS research center. After a brief business meeting, Mike Fak gave a presentation of the history of newspapers & news media in general. Mike gave a very educational and humorous program. He included an introduction to his new news-media venture, The Logan County Herald. It is an on-line news service focusing on all of Logan County, which will include an abundance of photos - noting that this outlet welcomes news items and photos from all Logan County citizens, government officials, businesses and non-for-profit organizations such as churches, schools, Lincoln Main Street, Logan County Chamber of Commerce, Logan County Tourism, historical societies from Atlanta, Elkhart, Middletown, Mt. Pulaski, Lions, Rotary, Kiwanis, etc. Rev. Lillian Sullivan of the A.M.E.
presented a history of the church from its beginnings to the present day. The program was presented to the LCGHS members and guests. The local congregation was established in Lincoln in 1868. Allen Chapel, which houses the congregation, was built in 1880 and is located in the 900 block of Broadway St. Rev. Sullivan shared many stories of Langston Hughes and Dr. William "Billy" Dyer, both of whom were members of the congregation while residents of Lincoln. Both became famous in their respective fields of literature and medicine. The chapel's edifice is in need of maintenance. An organization, Friends of Allen Chapel, has been working to raise the necessary funds to repair the building and upgrade the heating system.